Grey, Bluish Gray, Stone Grey, or Blay? Yesterday the Supreme Court overturned California’s Proposition 8 and the Federal Defense of Marriage Act (DOMA). 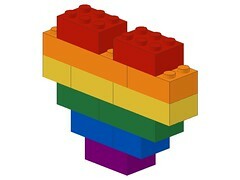 I created this simple rainbow heart sculpture design to celebrate justice being done at last. This isn’t an opinion or politics blog, so I won’t go on any more than this, but I just wanted to share this design with the world. 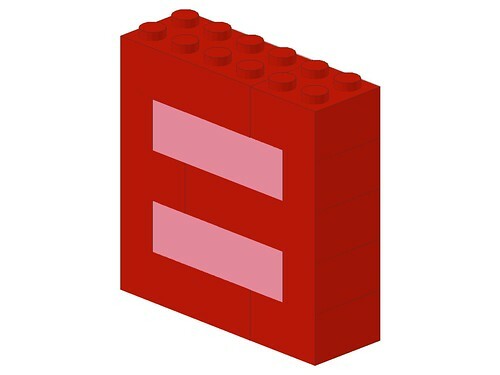 My version of the red and pink equality sign meme that’s taking over Facebook this week as the Supreme Court hears the Prop 8 and DOMA cases. Disclaimer: Brickpile.com is a participant in the Amazon Services LLC Associates Program, an affiliate advertising program designed to provide a means for sites to earn advertising fees by advertising and linking to amazon.com. Thank you for supporting my site by clicking on the ads and buying stuff. LEGO®is a trademark of the LEGO Group of companies which does not sponsor, authorize or endorse this site.